The winter months can wreak havoc on the roof of your home. Between dumping snow on it and subjecting it to freezing-cold temperatures, you can run into all sorts of roofing issues in the wintertime if you aren’t careful. Fortunately, there are some simple steps you can take to ensure that your rough survives another winter. Check out a few tips for winterizing your roof below. Clean debris out of your gutters. 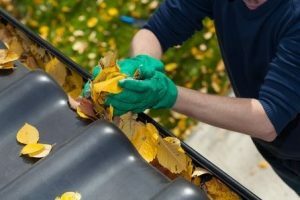 During the fall, your gutters can quickly fill up with leaves, sticks, dirt, and other debris. This can create clogs in your gutter system and make it difficult for water to make its way out of them when it rains. In the event that the water doesn’t leave your gutters, it will often freeze once winter starts and block your gutters completely. It can then cause snow and water to pile up on your roof and pull your gutters away from your home. This can lead to a lot of damage, which is why it’s easier to just clean your gutters out in the first place. Check the insulation in your attic. Does your attic have enough insulation in it? If not, it can affect the ventilation in your attic space and lead to heat loss through your roof. This can cause ice dams and icicles to form off your roof and do damage to it. The fall is a good time to inspect your attic to see if the insulation is doing its job. Replacing your insulation might save you from issues with your roofing in the winter. Trimming trees hanging over your roof. When snow and ice forms on tree branches, it can make them very heavy and cause them to break and fall during the winter. Therefore, you don’t want to have any branches hanging over your house in the winter. If you notice them in the fall, you should take the time to trim them so that your roof isn’t at risk of getting hit by a falling branch in the winter. A small amount of trimming can prevent a giant issue with falling branches. Do you need help with any aspect of your roof before winter hits? Bruce’s Central has experienced roofers who are ready to inspect and repair roofs prior to the winter season. Call us at 570-424-7250 to schedule our roofing services.